The last round of Travel Photo Roulette was hosted by Hart at Scene With A Hart with the theme of “Framing”. An excellent theme, and we are honoured to win that round. Thank you so much, Hart! 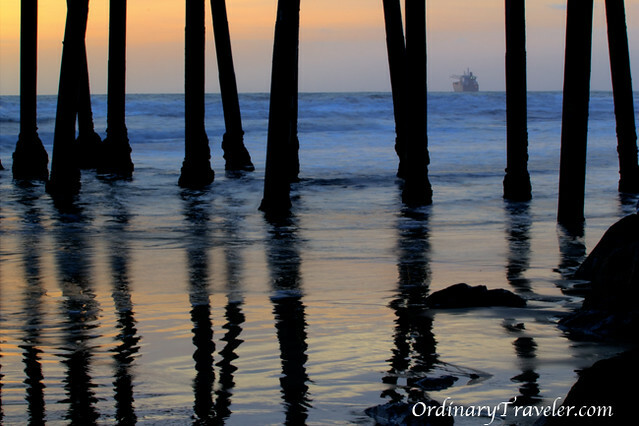 This round 30 coincides with the first anniversary of this travel photo roulette series. Jeremy at Living the Dream started this game back in November 4th, 2010. Thanks for this fun game, Jeremy! This week’s theme is silhouettes. 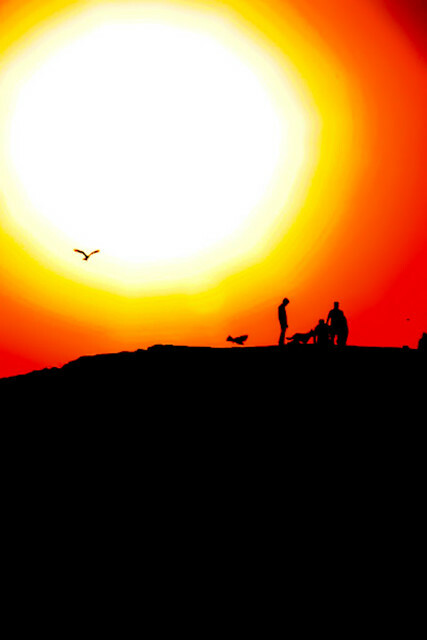 If you’ve been at the beach around sunset or sunrise with your camera, good chance you have some silhouette shots. But of course it’s not limited to that. Silhouettes of city skylines, people, animals, tree branches against the blue sky, sunsets in the desert, silhouettes of activities or sports, anything! Silhouettes that are beautiful, or funny, or tell stories, or evoke emotions, or that are unusual to be seen in silhouette, we would love to see the variation! Here’s an example. 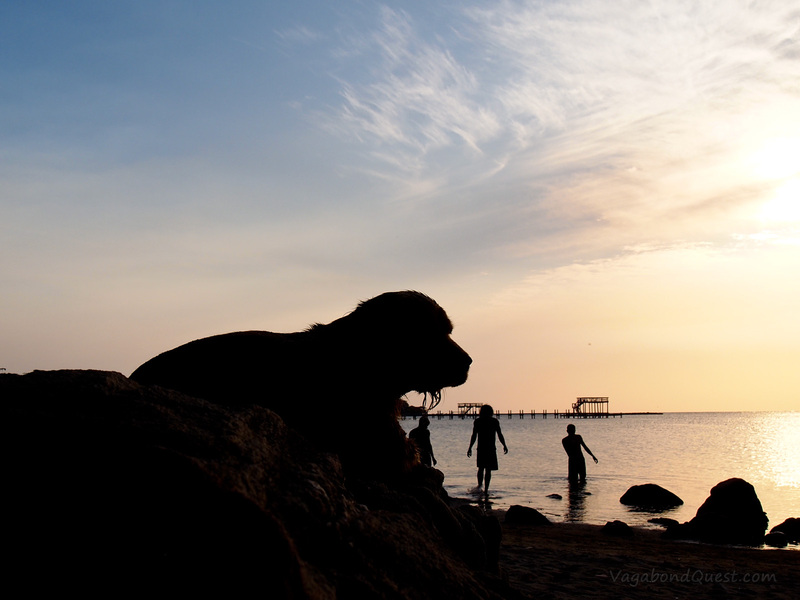 A silhouette of an old dog that was resting after swimming in the beach. He was sitting on the top of the rock pile, looking at a distance. His hair was still wet by the salty water, and you can see the funny hair shape hanging from its chin. What was he looking at? The sunset? The water? The kids he was just playing with? Or he was in a dreamy state? Silhouette of a wet dog. Roatan Island, Honduras. The rules are simple. The hosting blogger is the chosen winner of the previous week’s (7 days) game. 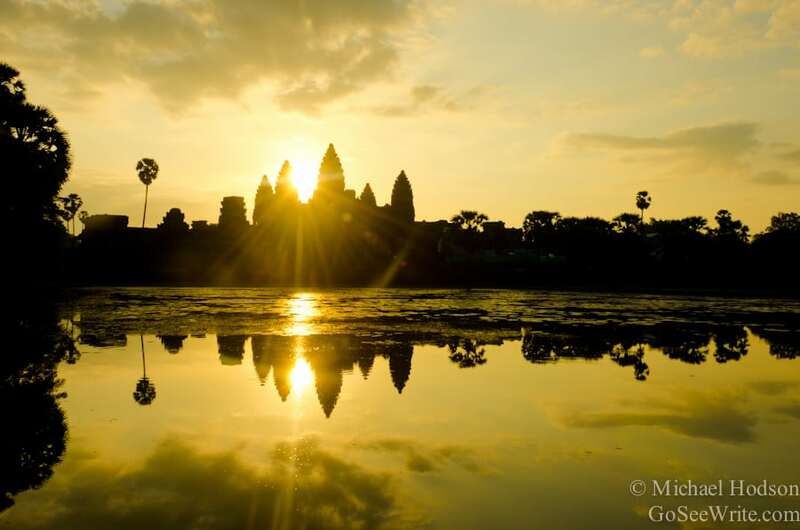 The new host chooses a generic keyword or phrase that other travelers submit photos to during the course of the week. Phrases can be as generic as ‘signs’ all the way to abstract thoughts like ‘religion’ and everything in between. 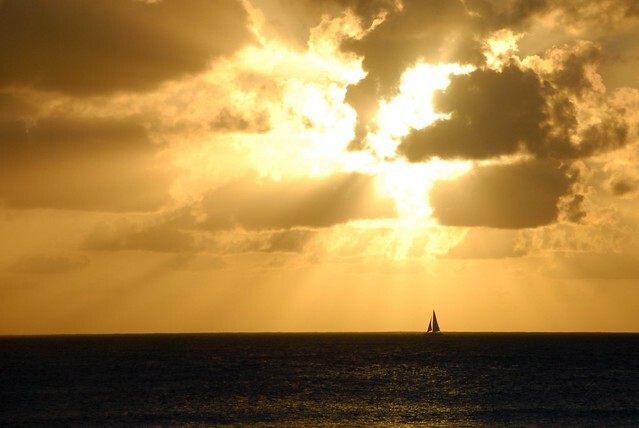 At the end of the week, the hosting blogger chooses their favorite photo that fits the chosen phrase and moves it to the top of the post as the winning entry with direction to the new host’s site for the next round. Readers can attempt to sway the author into picking a certain photo via comments, but the author can ignore comments as they see fit. The game is repeated with the winner hosting the following week’s game and choosing a phrase for new photo submissions. The more the merrier: Let’s get more people joining the contest by sharing this article on Facebook, Twitter, and StumbleUpon (share buttons above and below). One submission per Blog (so sites that have 2+ authors only get one entry). In this round, light photoshopping is permitted. I want all submissions to look natural. Abstract submissions welcomed as long as it fits within the interpretation of the chosen phrase. Remember, the hosting blogger chooses the winner, so if they cannot understand the submission, you might not win! Keep phrases general so that all bloggers can participate. 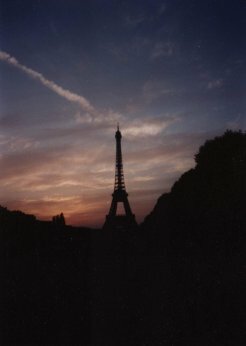 Specific items like ‘Eiffel Tower’ should be avoided but rather made open-ended like ‘monuments.’ For variety, it is ok to say focused things such as ‘monuments at night’ in which most of us have pictures of. Abstract thoughts are appreciated, but keep it within the realm that all readers will understand. No ‘Kafka-esque’, but ‘Overlooking Creation’ is able to be interpreted by all. *NEW* After 1 year, phrases can be reused, however new photos must be submitted. No obscene pictures or phrases allowed. Suggestive phrases and photography can be accepted, but please keep it within reason. Keep the ideas and photos fresh! Pictures from your entire portfolio are fair to submit. You do not have to take the photo within the week of the contest period to submit it. Most importantly, ALL PHOTOS MUST BE YOUR OWN. One last rule, since this is a competition for bloggers, we need you to be a blogger to be declared a winner. Sorry! To enter in the Photo Roulette competition simply leave a comment below with a link to the image (whether Flickr, Picasa or your own site) and I’ll upload it to this post. Don-t forget to provide a brief description or caption for the photo so the viewers can get a little background as to what’s happening. Check back here through the week to see all the entries as they come in – feel free to comment on them. The contest runs for 7 days from now, with the submission date being November 9-16, 2011 (Wednesday to Wednesday). I’ll announce the winner within the next few days after the deadline, and he or she will host round 31. A little note: Medium size pictures is preferred (around 600 px). Large pictures might slow down downloading time for everybody. The following is a list of the previously played rounds of the game and the hosting blogger for each. This list also doubles as a winner’s table as each topic host won the preceding round! Click the host’s link to go directly to that entry to see some stunning photographs from the chosen term/phrase! And…. Here are the submissions! Send us yours before Nov the 17th! Thank you all, for the awesome silhouette photos! Wandering alone within the ancient walls of the old city in Genoa, a story developed right before my eyes. This shot is one of a series I posted contrasting the old (the city itself) with the new (ideas conveyed through the graffiti) and the old again (the elderly of the city). I spent the rest of the day in a trance, lost in an ancient city, capturing the people of Genoa. The GypsyNester´s last post…GypsyNesters on the Radio! Great concept, great color, great photo Thanks for joining the game! I chased this band Underworld through on their Europe tour in 2011 when I was on my first RTW. Shot in a dark club, I converted the original image to black & white. Great. Now I really wish I took silhouette photos when I was traveling. A sunset over Hawaii with a silhouetted airplane and palm trees. Glad to be back in the Travel Roulette casino again! This was taken from a bluff below the Mehrangarth Fort in Jodhpur, India. There was a small group of leisurely hangers to the west of where I stood and the sun was setting behind them. Birds circled above making it all so poetic. Yes, the colors were manipulated after the fact, but not as much as you might think. It’s poetic indeed, great shot I also like the dog silhouette in the photo! Thanks, Nico! 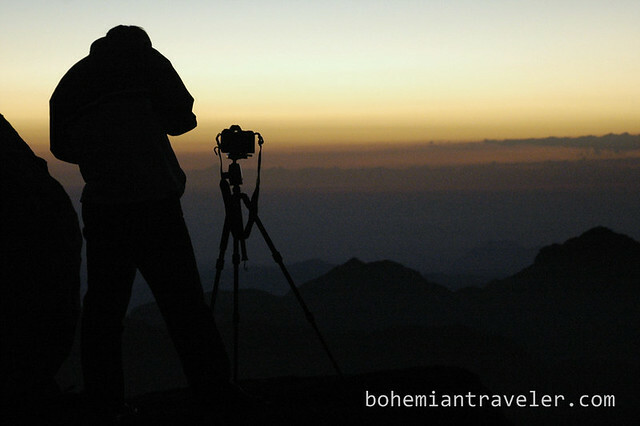 Here’s a shot from the top of Mt Sinai as we were waiting for sunrise. Awesome! One of the place that I wish to go to one day Thanks, Stephen! Shot in the bush in Western Australia! Loving these entries already! Especially the concert photo. Dope selections. Now you see how hard it is to choose only one winner. Looking forward to all the entries. Good idea for a theme! Fidel´s last post…Where Is the American Food? Unfortunately I can’t pick multiple winner Still the first day, and we got some brilliant shots already! Took me a while, but I found one that I love!!! This is a photo I took while I was in Morocco and watched the sunrise in the SAHARA DESERT!!! Oh my time there was amazing… check out more photos here http://breakawaybackpacker.com/2011/10/a-sahara-desert-expedition-in-photos/ If you haven’t seen them already!!! 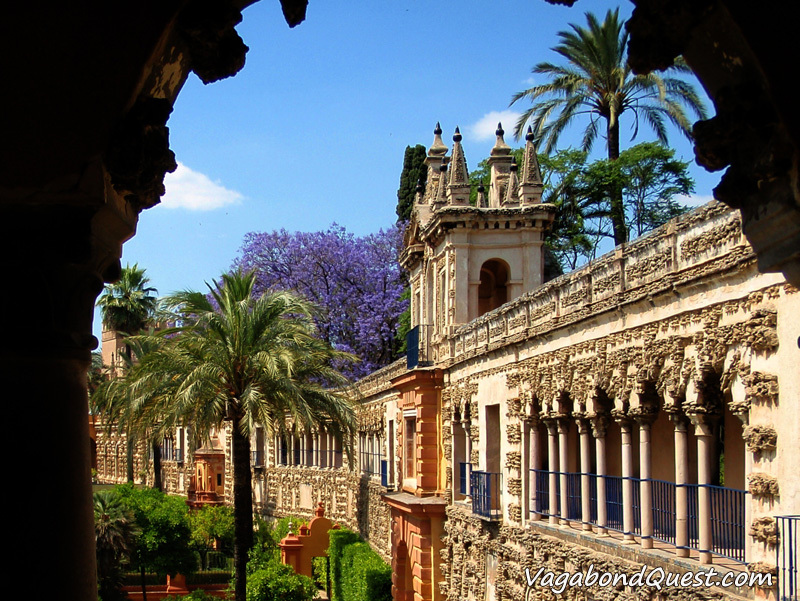 Jaime´s last post…Feeling at home in Barcelona! Jaime, that’s a killer shot! I’m in love with it, you shold make it posters/postcards and make money from it! Love this photo, it definitely gets our vote!! Wow, I cannot believe it has been one year. This posting series has turned into something fabulous. Lets keep it going! 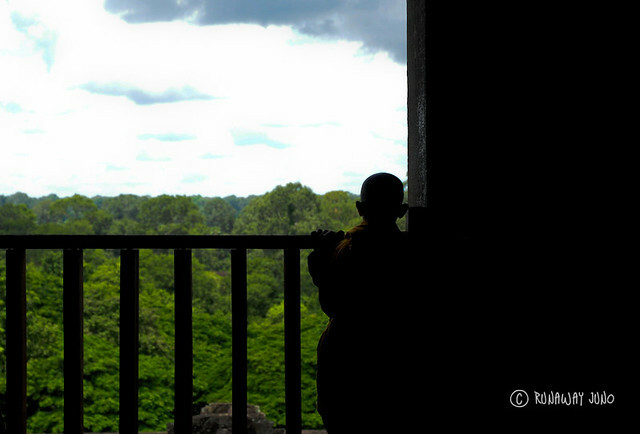 A boy monk at Angkor Wat, Siem Reap, Cambodia. Love how the silhouette of the monk boy really clearly looks like a monk boy! Hi guys, here’s my entry. This was taken in Belem Tower in Lisbon, Portugal. It was a Sunday (free museums) and the place was packed. But this woman was quite oblivious to her surrounding as she gaze out the window to the sea. 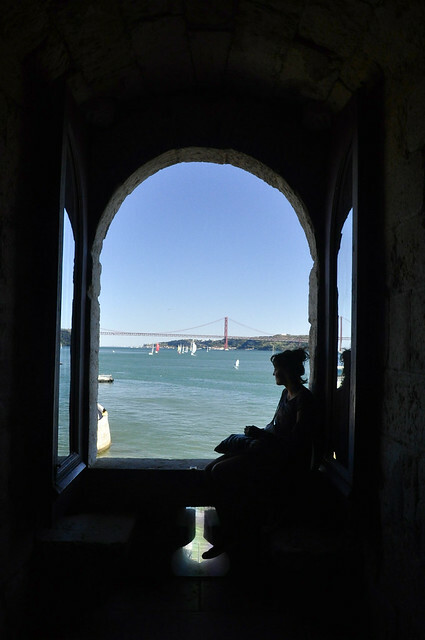 This was taken inside Belem Tower in Belem, Lisbon, Portugal. It was a Sunday (free museums) and the place was packed. But this woman was quite oblivious to her surrounding as she gazes out the window to the sea. As the sun set and the sky turned a multitude of colors, everyone sitting at the beach bar stopped what they were doing to watch. This man happened to be on the beach when it happened, which meant he was in the middle of both the beauty–and the moment. In Shell Beach, California… This was one of our many stops on a road trip through part of California. 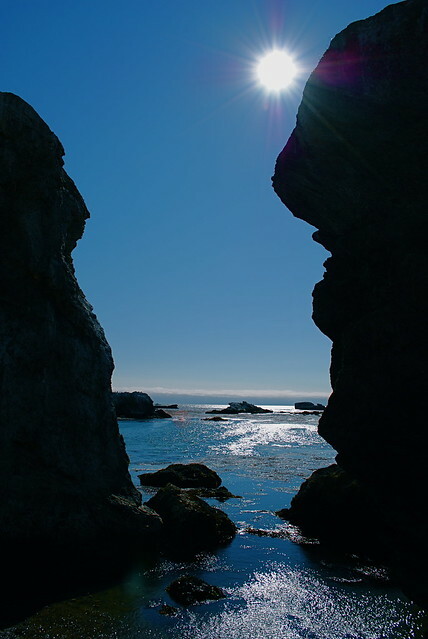 Ironically, Shell Beach had no shells, but there were many giant rocks like this and I loved taking shots of them. 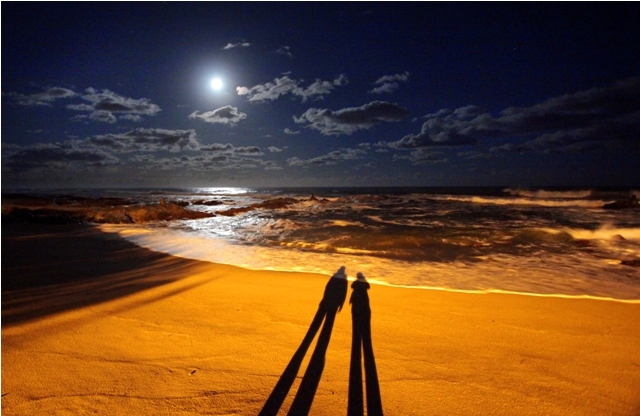 Taken on a beach in KwaZulu Natal, along the eastern coast of South Africa. The moon was full and we were lit from behind by a street lamp. I’ll count that as silhouette Gorgeous photo, thanks a lot! 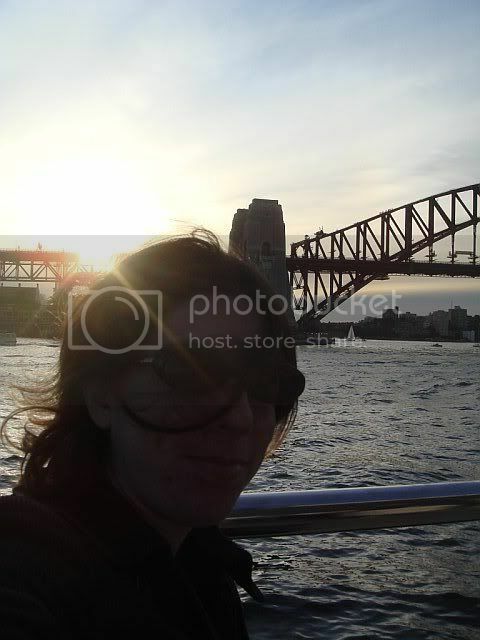 Unfortunately, I am pretty awful at silhouette-like pictures, but I have this self-portrait up in my apartment that I like enough, taken in Sydney, Australia. 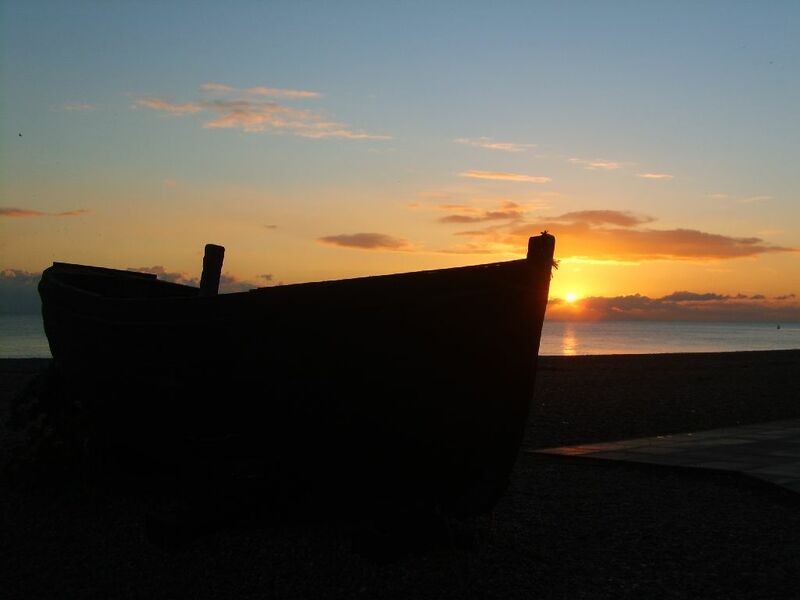 We had a hard time to find a picture to submit, but I like the silhouette of the fishing boat in this photo from Brighton, England. Nice, thanks a lot Jess and Dani!! Hey, you girls are in SEA (noticing Phuket post)? 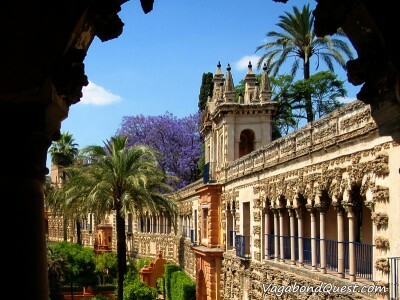 We are going to go there soon! Yes, we arrived in Thailand about a month ago Off to Laos next week, we’re excited to explore all of South East Asia over the next few months.. and maybe meet you guys somewhere finally?! Hope we’re not too late. 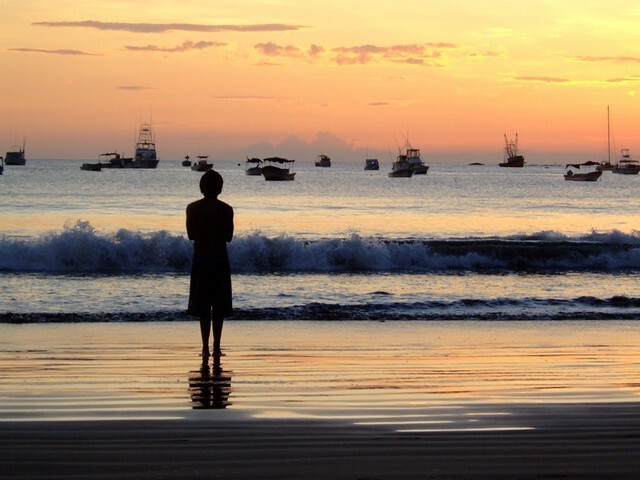 Some wonderful silhouette photos submitted so far. 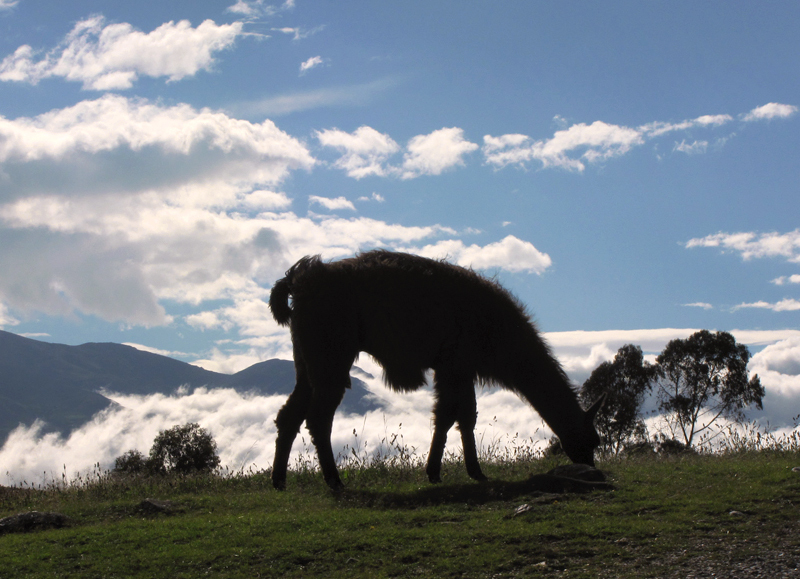 It was a long day of travel to Ingapirca, Ecuador, but worth it as we saw beautiful ruins and this llama which which just happened to be in the perfect position while eating his lunch. Super cute, Pete!! Love it! Of course I have to submit a jumping photo…haha…it’s one of my favorites. This picture was taken last summer while exploring the fantastic Mayan ruins of Uxmal with our lovable, but lazy, tour guide Nemo (and no, he wasn’t little). First one?!?! Haha Hopefully not your last, I’m having so much fun joining this game! This is my favourite jumping photo of yours, Ashley! The color combinations of the sky, the wall, and the ruin behind you is just perfect! This is a really old photo, one that was scanned in from a print copy made by a film camera, but it is one of my favorites that I have ever taken. Beautiful, really worth scanning it Thanks Andrew! Watching two bikers ride into the sunset at a park in Denver was truly a beautiful moment because the image was depicted as a symbolism of a typical life in Colorado. I forgot I took this photo! This was taken in Copacabana beach as the sun set the before the New Year’s Eve festivities were about to take place. Wow great photos so far. Here’s my submission. I was taking sunset photos on Cape Cod when I saw this father and son walking down in the distance right in front of the sun. One of my fav shots. Here’s mine – such still competition! This is crazy! Every single submission we get is ranging from beautiful to superb, how will we choose the winner? It’s going to be super tough! That’s what I just said! It’s going to be difficult for you guys. 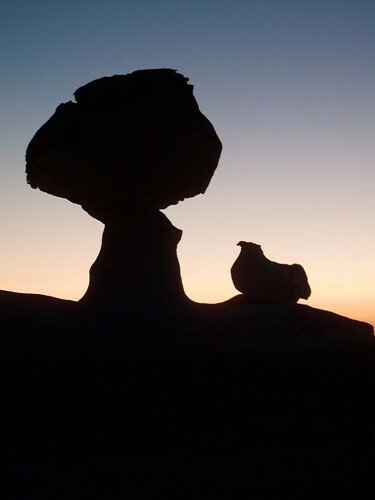 The chicken and the tree chalk rock formation found in the White Desert of Egypt. Deidra´s last post…Oktoberfest – The worlds greatest party? Wow! It’s gonna be difficult for you to choose a single photo as winner. Wonderful photos. Here is my entry photo for the theme. 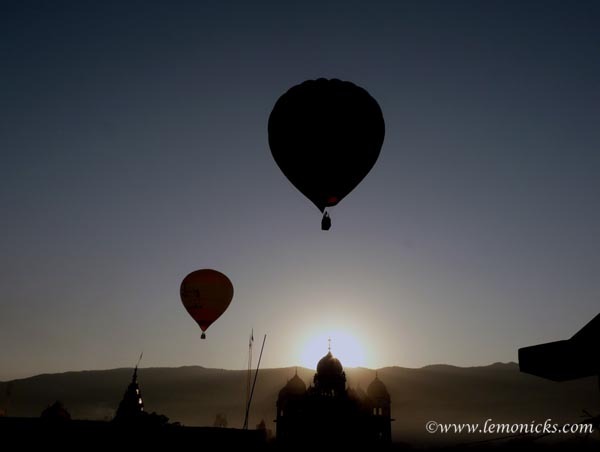 Hot air baloons at dawn at Pushkar international camel fair. No, there is no camel in it. Better late than never… Here’s mine. Fishing shack at sunset in Peggy’s Cove, Nova Scotia. It’s not too late, you are in Thanks Clair, it’s beautiful! OMG, this is brutal, Ryan and I can’t agree yet either… We have too many favourites!